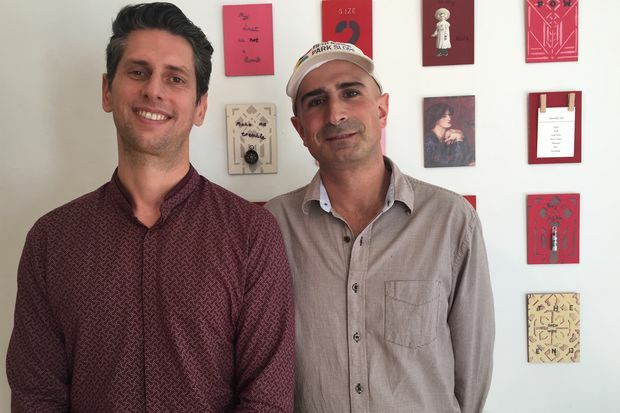 Hi Commerce CEO & founder Pierre Giraud (left) with Park Slope BID executive director Mark Caserta in the Fifth Street space the BID shares with a local art gallery. PARK SLOPE — A new tech startup believes its app can help local shops. As Amazon and other large e-tail sites continue to chip away at brick-and-mortars and residents lament the loss of their mom-and-pops, a startup called Hi Commerce wants shoppers to purchase items online from their neighborhood stores, providing an easy way to take advantage of the deep expertise of those who run them. But while the app might help assuage the guilt of New Yorkers who want to support small businesses, it doesn't solve the delivery conundrum — yet. Right now, the customer has to pick it up at the store unless the shop already happens to offer delivery. Beginning in the first quarter of 2018, Hi Commerce will begin offering 2-hour delivery, said Pierre Giraud, CEO & founder of Hi Commerce. Customers cannot pay for the items through the app either. The app acts sort of like a concierge or personal shopper, letting a customer looking for an item at a certain price point submit a query such as, “I’m looking for a gift for a 2-year-old who likes music.” You can even submit a picture to help. For instance, if you are looking for earrings, you can show your outfit that you want them to match, or you can to show your living room where you want a new painting. The app’s algorithm directs the question to its roster of shops, whose employees then send specific recommendations and can chat with the customer. Hi Commerce will roll out one neighborhood at a time, starting with Park Slope, where it went live this month with roughly 25 businesses, working with the Fifth Avenue Business Improvement District. Those shops joined about a group of 45 more geographically diffuse businesses across the city that were part of the pilot for the app, which focuses on the mid- to high-end range within the following categories: art, eyewear, gifts, home décor, jewelry and bags. The startup is eyeing Boerum Hill, Williamsburg, Downtown Brooklyn, the East Village and the Lower East Side as its next possible locations, Giraud said. The company is also launching in Paris, where Giraud moved from nearly 2 years ago. A range of stores on Fifth Avenue in Park Slope have joined the initiative including the Lullaby Baby (which sells furniture, clothes and more for babies), Private Picassos (which offers art classes for kids and adults), and d’mai Urban Spa (which offers services including massage, acupuncture and waxing). Hi Commerce is also enlisting shops on Seventh Avenue. DNAinfo New York submitted a query for a gift under $100 for a 17-year-old cousin, who likes baseball, and got a hip suggestion (a vintage Boston Red Sox shirt) from The Sport Gallery in the West Village. (The app, at this point, doesn’t allow a shopper to specify that they only want to buy from a certain neighborhood, and it has a smattering of stores across the city.) For a Park Slope-based option, the app suggested looking at Sport Prospect, which went out of business earlier this year. Another query, seeking a gift for a mother-in-law who likes to cook, proved more fruitful. Fifth Avenue’s O Live Brooklyn, which sells olive oils and balsamic vinegars on tap, responded within the hour suggesting olive oil gift boxes, olive wood accessories and ceramics in under $100 price-range. E-commerce is growing 23 percent a year, with Millennials and Gen Xers spending six hours a week shopping online and Baby Boomers spending four hours a week shopping online, according to a survey by BigCommerce and Square Analytics. Yet 46 percent of small businesses in the nation still don’t have websites, the same survey says. Giraud hopes his app can help those small businesses who cannot compete with creating massive and sophisticated websites, and he believes New Yorkers care enough about their neighborhoods that they won’t simply take a recommendation for a mom-and-pop and then hunt for that item elsewhere online to find something cheaper. “Today [shops] are already competing against Amazon. Customers are able to visit a store or a website and go to Amazon. [This] is great opportunity to connect these shops to customers very early in their search process,” Giraud said. For the two-hour delivery service, Hi Commerce plans to team up with Homer Logistics, a delivery service headquartered out of Midtown’s Grand Central Tech hub, which has a fleet of bike couriers. Delivery is expected to cost customers $6 to $12 extra and will be for a 1.5-mile radius, Giraud said. Even there, however, Amazon has made inroads, offering one-day delivery to its Prime members for $5.99, though non-Prime members have to pay more than $20 for the same service on certain items. Shop owners believe their personal touch can help. “We cater to everyone. If someone needs an alteration, cool, it’s done. You need gift wrap. Done,” said Angel Green, owner of the boutique Mivida Market on Park Slope’s Fifth Avenue, who made a profile for the app this week. Before Green opened her shop she operated online only and still maintains a fairly comprehensive website. But it is hard to keep up with her constantly changing inventory of designs made by women-owned businesses, she said. It requires her to set up professional photo shoots (where she uses “real” women and not models, she noted) and then crafts the text for each item and figure out the Search Engine Optimization terms so the site’s items will turn up in shopper’s online searches. “It’s a lot easier to manage a website when you don’t have bills and overhead,” Green said. Valeen Bhat, owner of Private Picassos, said that through the app, she's been suggesting families buy her studio's $20 clay or painting art kits for kids' birthday presents, but since she doesn't sell online (yet), she can only hope people come into the gallery. "I view it as a way to get more people to know about us," Bhat said. "If you can order [a kit] and have it delivered, for us that will be a bit of a game changer." She believes busy families, who often have multiple birthday parties a weekend, will pony up the delivery fee if they're buying several kits at once. 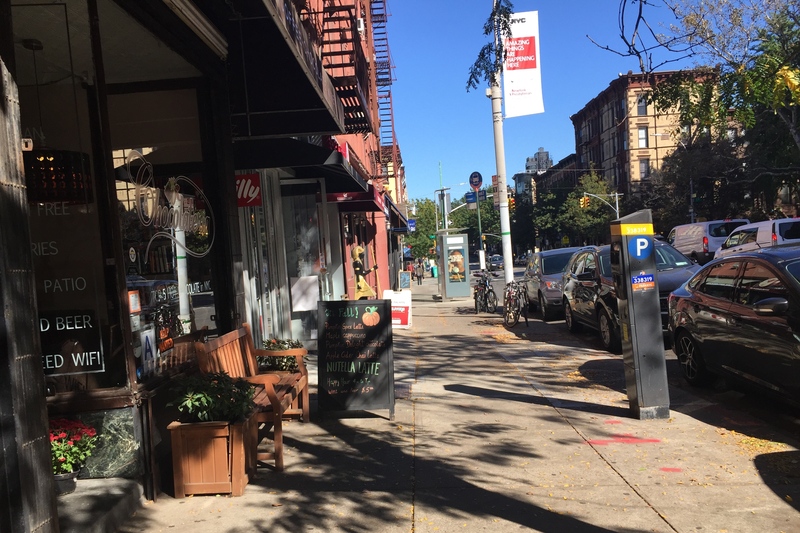 Park Slope Slope Fifth Avenue Business Improvement District executive director Mark Caserta was eager to work with Hi Commerce, which has spent the last few months developing the neighborhood initiative. Caserta has been proactively looking for creative ways to help small businesses on the shopping stretch where retail rents have shot up along with other costs, like the minimum wage, while business has gone down for many. Understanding that many people nowadays can only shop in the evenings or on weekends, Caserta has been spearheading a “shop small” campaign and special events at the local shops, like next month’s fall harvest pop-up dinner at Kos Kaffe, which is known more for its coffee than its food.